Ezra Malakov was born in 1938 in Shahrisabz, Uzbekistan. During the 1970s and ’80s he performed and recorded with the national radio and TV orchestras in Tashkent, singing classical and popular pieces. 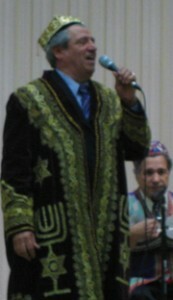 He moved to Queens in 1992, where he is a key exponent of Bukharian religious music, serving as a hazzan at Congregation Beth Gavriel and producing several recordings. He has recently completed, with the noted maqomist Ari Babakhanov, notations of over one hundred religious songs with accompanying CDs, soon to be published. He is joined tonight by David Davidov on the tar and Osher Baraev on the doira.